What’s the best sports app for iPhone? Baseball season is upon us here in the United States, and I am already looking forward to Spring Practice for college football. To be perfectly honest, I am a glutton for punishment when it comes to sports. I root for the Atlanta Braves who last won a World Series in 1995 despite winning fourteen straight divisional titles. In 1996, they went up 2–0 on the New York Yankees in New York and then proceeded to get swept at home. I also root for the Atlanta Falcons, and they famously were up 28–3 in the third quarter in the Super Bowl before the Patriots made the most epic comeback. To make matters worse, my beloved Georgia Bulldogs lost to Alabama in overtime of the college football championship in January of 2018. There’s an old joke that being a Georgia sports fan is hazardous to your health. Despite that, I love sports. Smartphones have made following a lot of teams and sports a lot easier thanks to a plethora of apps. With a number of options to pick from, how do you find the best sports app for iPhone? When I look back at my App Store history, there are two apps in the original ten that are technically still available for purchase. 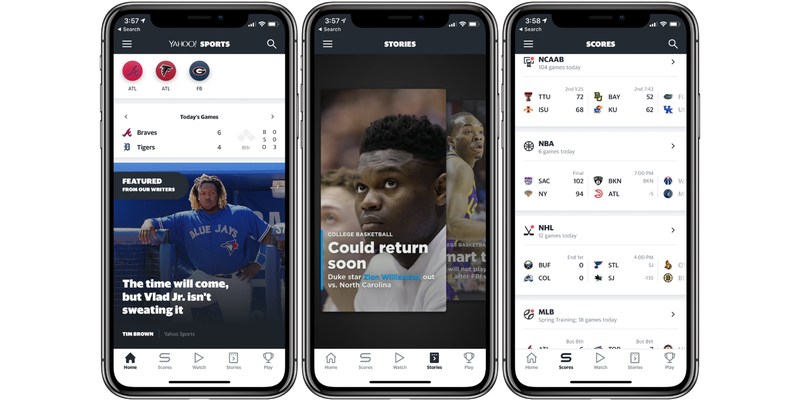 The first is the ESPN iPhone app, and the second is the Citizen Sports iPhone app. Citizen Sports was eventually purchased by Yahoo and rebranded as Yahoo Sports. Yahoo Sports powers a lot of Siri’s sports knowledge as well. 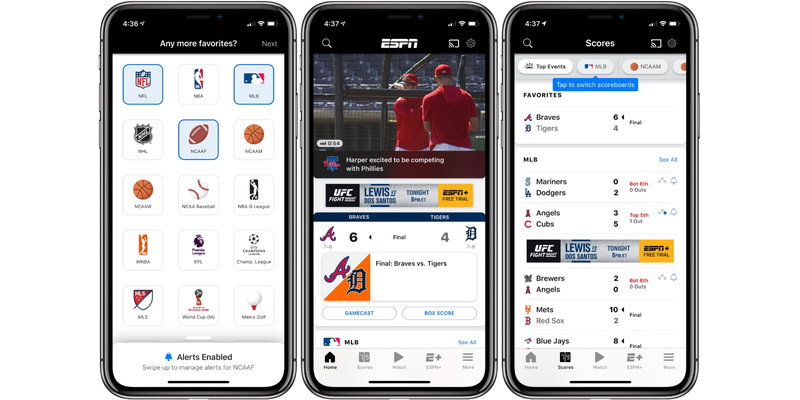 One thing I want to note for this roundup is that I am not considering league specific apps like MLB’s At Bat simply because they are focused on a single league. The ESPN iPhone app is probably the most popular sports app for iPhone. In fact, ESPN could put out a really terrible app, and it would still be popular. The ESPN brand is synonymous with sports. When you first launch the app, you are prompted to choose your favorite sports. Doing this helps the app customize how it presents news to you. You also get to choose your favorite teams. Along the bottom row are tabs for Home, Scores, Watch, and ESPN+. The Home tab is the place where you’ll want to start. 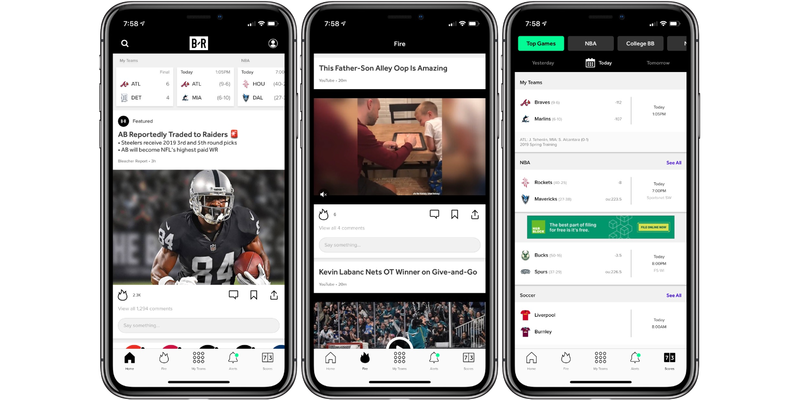 It has built in video for news, scores for your favorite teams, and other news from around the leagues you follow. The scores tab shows scores for all the major leagues, and it starts on a “Top Events” section to show you the most relevant scores. The watch tab includes the ability to watch live sports (assuming you have a cable login), and you can also cast to a compatible device. The ESPN+ tabs give you access to subscription only content such as documentaries and exclusive UFC content. Pricing for it starts at $4.99 per month. ESPN+ doesn’t include access to content on ESPN, ESPN 2, ESPN News, etc. Overall, the ESPN app is a solid contender for the best sports app for iPhone. It has plenty of news, scores, and live video. It’s a free app on the App Store. As I mentioned earlier, one of the original apps I installed on my first iPhone was the Citizen Sports app that was later purchased by Yahoo. The Yahoo Sports app offers the best overall experience. It has a clean interface, provides a plethora of details, and just generally gets you to the information you desire. Along the bottom, there are very similar tabs to what ESPN offers. The Home tab is your “hub”. This tab is where you follow along with your favorite teams, see upcoming games/scores, and see the current news. The Scores tab is where you can look deeper at scores for the leagues you are interested in. You can also tap into a certain game to see more information like stats, tweets, and more. You can also set individual push notifications for any single game as well. 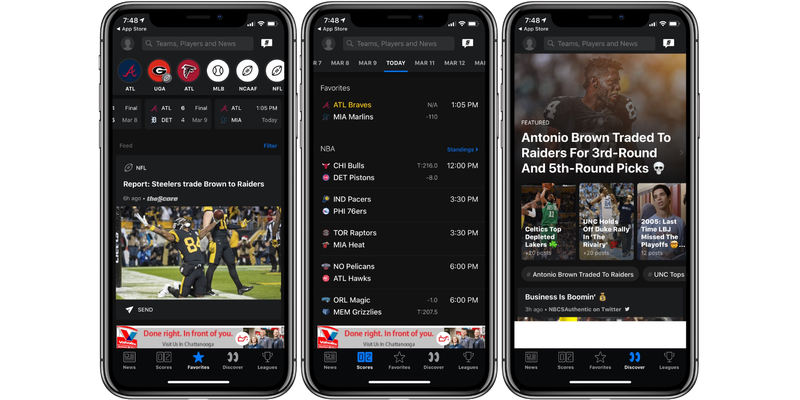 The Watch tab is where you can watch video based news, original content, and live sports (when available). The Stories tab is where you can see Instagram style stories about sports. Overall, the app does what you need it to do and no more. The Yahoo Sports app is free on the App Store. Another app I tried was theScore iPhone app. Like the previous apps I’ve reviewed, it has a tabbed home screen with news, scores, and more. The overall design is dark, and there is no option for a light mode. The News tab makes it easy to bounce between leagues (or just on top news). The Scores section is also well done. It includes your favorite games at the top, and then you can scroll down to look further at each individual league. The Favorites section pulls news and scores for your favorite teams into a customized section. I am not sure why this couldn’t just be done in the News and Scores section, though. Overall, the app is good, but I don’t think it’s the best sports app for iPhone. However, it’s easy to navigate and find your way around. You can download theScore on the App Store for free. 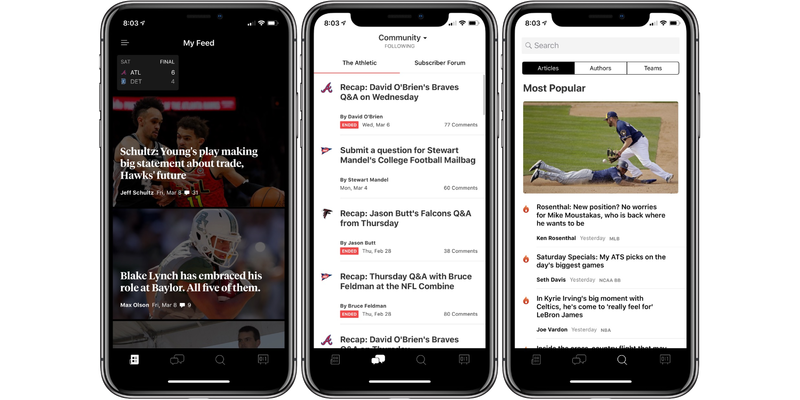 The Athletic is a subscription only/ad-free sports app. Over the past year or so, they’ve signed a lot of great journalists to build out their team. I know for the Atlanta market, they signed UGA and Braves beat writers from the AJC. They’ve got an interesting model considering most of the apps include ads. The Athletic is subscription only ($60/year), so you can’t read with the news without signing up. If you are a member, it’s a great app to have for the original news reporting, but I prefer other apps for tracking stories and general industry wide news. It’s the top place right now for original stories, but it’s not the best sports app for iPhone. The Athletic is a free download on the App Store. The Bleacher Report is the final app that I tried, and it’s another solid contender. Like the others, it allows you to customize your favorite teams, see scores, and follow along the with the latest news. One thing that sets The Bleacher Report apart is the “Fire” section. It shows you trending sports videos. Outside of that, it’s really just more of the same with all of the other apps I compared. The Bleacher Report can be downloaded for free on the App Store. Overall, I think it comes down to two apps. I think the Yahoo Sports app and the ESPN app are head and shoulders above any other apps on the market. While I prefer Yahoo’s interface overall, I still have ESPN installed so I can use the Watch functionality. For my day-to-day tracking of news and scores, I do prefer the Yahoo Sports app, though. Bradley Chambers looks at various app categories and makes recommendations on the best options.